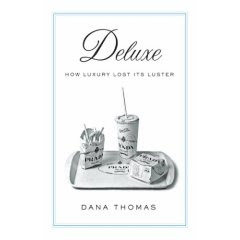 Dana Thomas has a book out entitled "Deluxe: How Luxury Lost Its Luster." In it the reader learns about the obsession the Japanese have with luxury items. And it is not just the so-called socially hip and fashion-informed who fervently go after such things as ridiculously-priced Luis Vuitton purses and Hermes bags. Thomas even writes about a Japanese monk with an active penchant for French luxuries. Knowing my natural inclinations, I am cognizant of the fact that the only shopping I can do while preserving my sanity has to be fast and 'to the point.' I have no time to waste looking at brands I don't know. I know what works for me and I stick with it. Ergo, being brand-conscious saves me and mine time and resources eventually. Having been a fan of Harajuku styles for quite some time, I wasn't as impressed by the book as some of my associates. The Japanese enjoy haute couture. And? I'm not sure this is something that only the Japanese nurse a fascination for. The premise is certainly not that idiosyncratic. Could it be that much of haute couture is simly qualitatively superior? Granted, some couture notions are preposterous but that's another issue. I hold the opinion that brand-loyalty is fundamentally a question of economy of time, resources, and space. It allows many to practice a way of living that is more quality- rather than quantity-oriented. Minimalism helps us all in the long run, oui? And since the notion of 'space' in Japan is not akin to that of the new world, could it be that the spending habits of our Japanese friends could be a tad informed by it? While Dana Thomas's book is an interesting read, it fails to impress and wow. The Japanese like brand names? Wow! Somebody do a movie about this. Quick!